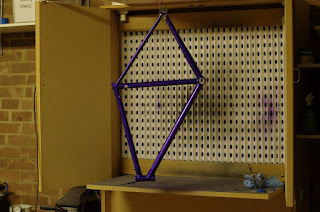 I painted Kristyn's frame pearl purple. Previous frames have been either solid white or solid red, and painted entirely with Imron two-part paints. As the local place where I buy paint from no longer stocks Imron, I went on a search for something new. That search led to Auto-Air, which is made for custom car and motorcycle painting. It's about as different a paint as you can get from Imron. It's water based, which is weird, but makes cleanup so much easier. One of the really neat things about the Auto Air paint is that it's readily available in teeny little 120ml pots. I only used around 60ml to paint kristyn's bike, so a single little pot is all I need. Plus, it comes in a huge array of colours. The process I followed with Kristyn's bike was to first prime with epoxy primer as usual, then lay a thin coat of white Imron down. I could have used the auto-air white sealer, but I have half a litre of white Imron to hand. After giving the white base coat a day or so to set up, I then mixed my pearl purple with medium reducer 3:1 (to suit my 0.5mm nozzle airbrush), and sprayed a really thin misting coat. I gave it ten minutes to set up, and sprayed a second, slightly heavier coat. I repeated the process half a dozen times - very thin coats building colour slowly. The auto-air paint lets you know quite definitely if you're putting it on too thick, by taking on a mottled appearance. It's actually pretty easy to work with, and suits my methodical methods much better than Imron, which always leaves me feeling rushed. So after leaving the frame to set for another day, I then clear coated it, first with a misting coat, then after twenty minutes putting on a full gloss coat. The final product looks pretty good. It's still got another couple of coats of clear to go, once I get decals sorted, but in the meantime Kristyn is happily riding it and showing it off to everyone. Suzy, my brothers been using Auto Air paints to paint custom helmets and I've often wondered if its suitable for bikes. What sort of clear do you use? Is it a 2 part? I put a DeBeer Urethane 2 part clear over the top, which works quite well. Suzy, now that you have used your air brush for sometime would you recommend others to go that route, or is a touch-up spray gun a better choice for bike frames? Also, how do you like your painting cabinet? I was thinking of building a temperary painting booth but a cabinet would be easier to store. Do you have much overspray in your garage? p.s. Thank you very much for posting all this information. 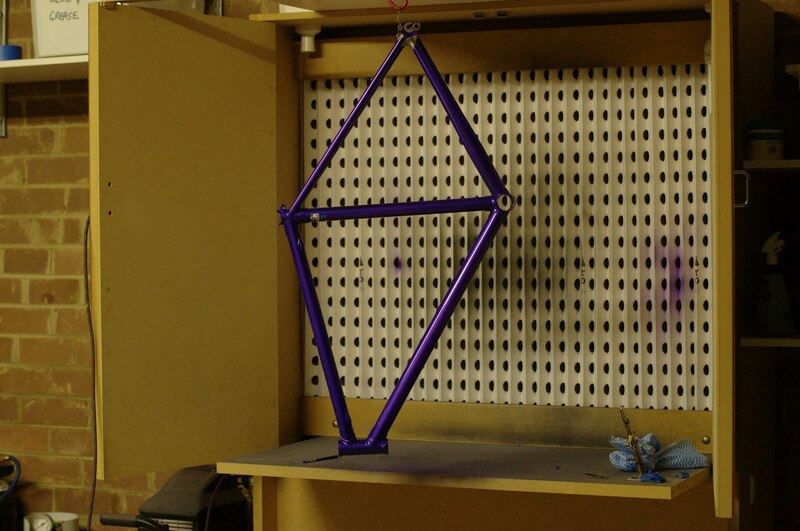 You're my go-to for frame building info! My current airbrish is an Iwata Eclipse HP-BCS, with 0.5mm nozzle. It's barely big enough for the way I paint frames. I tend to reduce my paints more than the instructions (which are intended for two coats on automotive bodywork) recommend. I've got a bit of a history with different guns. The very first frame I painted was done with spraycans, which wass awful and makes a huge mess. The paint looked okay at first, mbut was dreadfully delicate. When I swapped to activated paint I bought a cheap spraygun from the hardware store, with a 1.8mm nozzle. I tried to spray with it but gave up - there was zero control of spray pattern - it was either on like a firehose or off. I went back to the hardware shop and bought a "touch up gun", with a 1.2mm nozzle. I used this to paint the first frame I built, but it wasn't much better than the first gun - very little control, dreadful atomisation, and it filled the whole garage with overspray. So that's when I bought the airbrush - I wanted something that was much more controllable, and probably overcompensated. The airbrush gives me really beautiful atomisation and allows me to do wonderful fine mist coats, but is quite fussy about viscosity and is a bit of a pain when it comes to the final clear coat, because I'm rushing to get the coat finished before it starts to set up. I've just bought a new gun - an Iwata RG3, with a 1.0mm nozzle, which I intend on using specifically for clear. This is literally the next size up from the airbrush that I've been using. It's an expensive tool, so I hope it will still provide really good atomisation and fine control of the paint, but allow me to get the final clear on a little quicker. My booth is small but serviceable. I have no issues with overspray in the room at any point but for the last clear, where it can't quite keep up and things get a little misty. I have plans to upgrade it a little to improve the airflow.